What you should know about sunburn, sunscreen, UV protective clothing and the CANSA seal of recognition. South Africa is known globally for its glorious sunshine; however, what is not mentioned is just how dangerous our renowned sunshine is! The bad news is, the country has one of the highest incidences of skin cancer in the world and it is rising. The good news is that skin cancer is easily preventable and if detected early, is highly curable. All sunburn is potentially dangerous. While people may consider a bronzed body or a peeling nose as part of life in South Africa, it is really a tangible reminder of the risk of skin cancer. You may not realize it, but the daily damage done by the sun's UV rays builds up over time, so that many years from now it may result in melanoma or other forms of skin cancer. As much as 80% of UV-related skin damage occurs by age 18. Just one blistering sunburn as a child significantly increases the risk of developing melanoma in later life. Everyone, although people with darker skin are less susceptible because their skin contains more natural melanin, that protects skin from sun damage. Choose to stay safe in the sun, whether it is hot or not. Sun safety habits formed at an early age last a lifetime. If you usually start to burn within 5 minutes, a sunscreen with a Sun Protection Factor (SPF) of 15 protects your skin for 15 times as long, i.e. 75 minutes. Remember, there is no such thing as a 'complete' block. Ultra Violet rays are part of the light spectrum that reaches the earth. There are two kinds of UV rays that damage our skins. The broader UVB rays cause the browning reaction that we call 'tanning' and are responsible for the painful burning, redness and ultimately, skin cancer. UVA rays penetrate deeper into the skin and can damage the structure of the cells, causing ageing, as well as increasing the risk of cancer. FOLLOW THESE GUIDELINES TO BE SUNSMART! Stay in the shade as much as possible or under an umbrella. Remember that UV rays reflect off cement, water, sand and even grass, so you can get sunburn in the shade! Remember, UV rays are not the same as heat. You can get overexposed even when it is cool, so take care on windy or overcast days. Limit total time in the sun, especially between 10:00 and 15:00, when the sun's rays are at their most harmful. Cover up. Wear a thickly woven hat with a wide brim and/or flap and clothing that is densely woven. Look for UV protective clothing, swimwear, umbrellas and shade-netting sporting the CANSA Seal of Recognition on the swing tags. Your eyes also need protection against the harsh African sun. 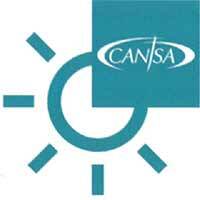 Look out for sunglasses with lenses recognized for effective UV protection by CANSA. Use a broad-spectrum (UVA & UVB) sunscreen with a Sun Protection Factor (SPF) of 15 or higher, preferably one bearing the CANSA Seal of Recognition. Apply sunscreen liberally to all exposed skin. Remember the back of the neck, tips of ears, lips, arms and hands. Re-apply frequently, especially after swimming. Remember that towel-drying removes sunscreen. Scientists warn that sunscreen can only deliver its promised protection factor if applied properly and in the correct thickness. Asymmetry - a mole or mark with one half unlike the other. Common moles are round and symmetrical. Border irregularities - scalloped or poorly defined edges. Common moles have smooth, even borders. Colour variations and inconsistency - tan, brown, black, red, white and blue. Common moles are usually a single shade of brown or black. Avoid using sun beds and tanning booths. They deliver concentrated UVA radiation - in some cases more UV than the sun! This causes your skin to age more rapidly, as well as putting you at higher risk of developing skin cancer. There are three major forms of skin cancer, with melanoma being the most serious. If left untreated, skin cancer can be life-threatening. Raised, translucent, pearly nodules that may crust, ulcerate and sometimes bleed. Occurs most often on the face and other exposed areas, but can appear anywhere. Usually raised, pink opaque nodules or patches that frequently form ulcers or sores in the centre. Appears most often on exposed areas of the body. Often small, brown or black, or larger multi-coloured patches with an irregular outline which may crust and bleed. Malignant melanoma may occur in pre-existing moles or skin spots. They can also appear like freckles from previously normal skin. This is your guarantee that manufacturers of UV protective products and clothing have complied with the strict set of criteria developed by CANSA. Products have to comply with the SANS Sunscreen Standard before the Seal of Recognition is awarded. CANSA's Seal of Recognition appears on sunscreen products, clothing, hats, sunglasses, umbrellas, vehicle glass and shade-netting. If you want to stay safe in the sun, be SunSmart and buy products sporting our coveted Seal of Recognition. The Bushmen were never troubled by lions. They sprinkled a secret powder on their fires at night and the aroma that permeated their skins made lions nauseous so they kept their distance.